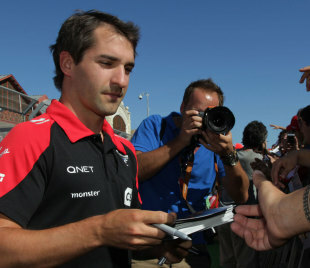 Marussia has confirmed that Timo Glock has left the team after coming to a mutual agreement with the driver. News that Glock was on his way out broke over the weekend and was confirmed in a joint statement on Monday morning. With a pay driver expected to replace Glock, Marussia team principal John Booth said it had been a decision taken against a backdrop of "tough economic conditions". "Timo has made a very significant contribution to our team over the past three seasons, helping us to develop our package to the point where, for a large proportion of the 2012 season, we were holding 10th place in the constructors' championship. Timo is a fantastic driver and he has been a very popular member of the team." "Our team was founded on the principle of benefiting from proven experience whilst also providing opportunities for young emerging talent to progress to the pinnacle of motorsport. Thus far, this philosophy has also been reflected in our commercial model. The ongoing challenges facing the industry mean that we have had to take steps to secure our long-term future. Tough economic conditions prevail and the commercial landscape is difficult for everyone, Formula One teams included. "We would like to thank Timo for working with us to reach this decision, especially as he had a valid contract, and also for the contribution he has made to our team. We wish him all the best for his future and I would like to congratulate the next team acquiring the services of such a competitive, professional and experienced racer. "We will provide an update regarding the completion of our driver line-up in due course." Glock said he had not planned to leave the team this year but that he is "excited" about his future. "I have had three excellent years with the Marussia F1 Team, during which I had the chance to actively participate in building and developing the team in its endeavours to succeed within the Formula One World Championship. "I would like to wish the team good luck in navigating this next period and thank everyone for the great times we shared and the support I have received. Although it is not the path I expected to be taking, I am in fact very excited about what the future holds in terms of my own career and I hope to comment on that very soon." There are now three vacant positions on the grid with Force India and Caterham yet to name their completed driver line-ups.